Former French Ambassador to Moscow Jean de Gliniasty told Sputnik on Monday he saw favorable preconditions for a positive meeting between the Russian and French presidents in Paris as, he assumed, there was a desire of the Russian side to contribute to bilateral relations' development. PARIS (Sputnik) – Russian President Vladimir Putin arrived in France earlier in the day to meet his French counterpart Emmanuel Macron. The two heads of state will get to know each other over a working lunch in Versailles, where Putin will inaugurate an exhibition dedicated to the 300th anniversary of Russian Emperor Peter the Great’s first visit to France. 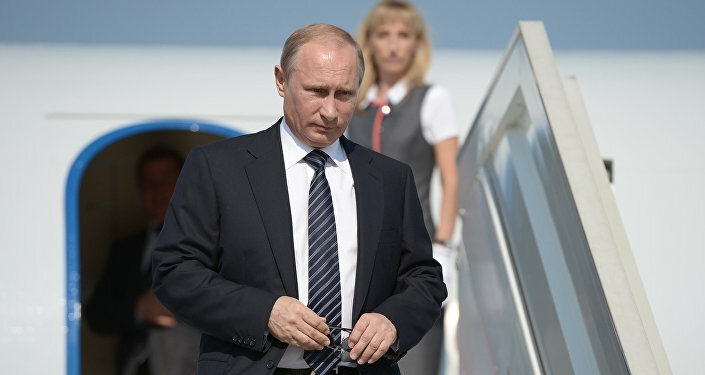 "It [Putin's Paris visit] is a good thing. The French foreign policy starts taking its shape. And there is a desire of the Russian side to invest in the relationship with their French partner. We will see what it gives. So far the preconditions for this meeting are favorable and interesting," de Gliniasty, who served as French ambassador to Russia from 2009 until October 2013, said. Earlier in the day, Russian Ambassador to France Alexander Orlov told the Europe1 radio broadcaster that a lot depended on this first meeting between Putin and the newly election French leader, saying that it was important "to start dispersing the mistrust accumulated over the past years." Putin’s visit to France comes almost immediately following the NATO and the G7 summits, where Macron met with European, North American and Japanese leaders. The fight against terror, a topic discussed during both summits, is one of the major issues on the common agenda.